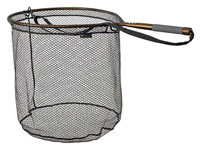 Made in New Zealand by a famous manufacturer The lightweight frame measures 21x 17 and the net extends to 57 overall. Utilising a proven design and filled with a black knotless mesh bag. The NZT offers great quality without the premium price. Silver Series nets offer what we believe are the lightest high quality portable nets available. The McLean Hinge-Handle folding system is brilliantly simple and 100% reliable both in terms of durability and one-handed operation. 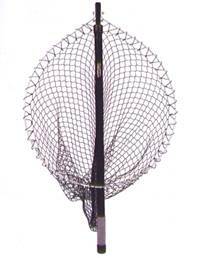 A Superb Stillwater Trout net. The Head measures 22" by 18.5". Overall length is 47" when opened and 26.5" when stored. Belt clip and grip fitted to handle. A smaller version of the MLH40, ideal when wading where a longer handle could get in the way. Head measures 19" by 16.5", depth 22". Overall length when open is 37". Available in two sizes, 16" head or 20" head, light, strong and in two head shapes, circular or D-shaped. With telescopic handle, locking head mechanism, belt clip, bronze anodised finish and non-slip handle grip. Exactly as McLean Bronze Series model MRL but fitted with new deep rubberised mesh net bag. 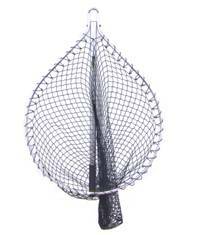 An ideal stillwater / Reservoir / Sea Trout net. 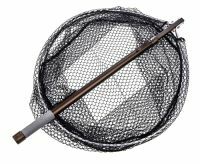 Our biggest selling Bronze Series net, the MRL, now fitted with a longer telescopic handle ideal for boat fishing/high banks/platforms etc. Built to the same high standard as all other McLean nets. 20" dia. Round locking head. Overall length when fully extended 81", and when collapsed is 33.5". Larger nets for stillwater fishing, constructed from high quality anodised bronze aluminium and stainless steel components, with non-slip, rubberised grips and soft woven nylon bags. Telescopic handles for easy storage in the boat. Bronze series ejector nets are spring loaded and extend instantly at the press of a button. Both nets are designed for easy carrying. 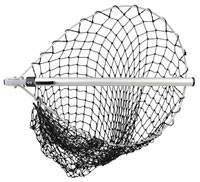 Press the button and the spring loaded handle immediately extends from 20" to 31" hinged fixed frame net. Net opening 16" wide and 22" deep. Overall extended length is 48". Handle with rubber grip. Knotless net meshing. Bronze aluminium construction. Press the button and the spring loaded handle immediately extends from 20" to 31". 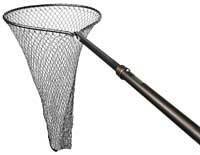 Built tough using high grade materials, this new Bronze series net will even withstand Saltwater use. It floats if dropped, comes complete with an adjustable lanyard for transport and is fitted with the McLean fish-friendly Rubber Netbag.